The two ways players in military vetronics can approach business is through integrating their systems into new vehicles and retrofitting them to older ones. Most of the defense agencies across the world possess a large number of older vehicles that hold major opportunities for use of modern and more rugged vetronics systems. Additionally, key players are also focusing on the high demand for embedded technology through the implementation of advanced SWaP specs on modern vehicles. Another driver that vetronics players can look out for is the rapidly growing demand for real time data tools in the defense industry. Vetronics are the electronics systems integrated in military vehicles for streamlining activities such as communications, navigation, surveillance and vehicle health management among others. The global market for military vetronics is primarily driven by escalating need for real time data to improve battlespace awareness of soldiers and mission specific operational efficiency of the military vehicles. The development of embedded technology is rapidly transforming the military’s capabilities for highly network centric operations. In addition, the initiatives undertaken for reduction of size, weight and power consumption (SWaP) of electronics within the military vehicles in order to increase internal space for solider accommodation and ammunition reserves is also driving the growth of the market for vetronics. Moreover, increasing investments in developing unmanned ground vehicles for military applications are also pushing the market forward. Owing to these factors, the market for military vetronics is growing at a significant pace globally. Following the increasing modernization projects undertaken in countries such as China Japan, India, Israel, Saudi Arabia, UAE, and South Africa boost the demand for military vetronics over the forecast period. This factor is also analyzed to create new opportunities for the vetronics manufacturers globally. Conversely, the market for military vetronics is encountering a major hindrance due to the demilitarization initiatives adopted by countries in North America and Europe. However, the impact of this restraint is analyzed to shrink over the forecast period. In this report on the global military vetronics, the market has been segmented based on system, vehicle type and geography. It also includes drivers, restraints and opportunities (DROs). The study highlights current market trends and provides the market size of 2014 and forecast from 2015 to 2023. The report covers the current market scenario for military vetronics and highlights future trends that could affect the demand for the same. The global military vetronics market is analyzed to observe a steady growth from 2015 - 2023 at a decent CAGR. Based on geography, the market has been segmented into North America, Europe, Asia Pacific and Rest of the World (RoW). On the basis of segmentation by system, the market has been categorized into control and data distribution systems, display systems, power systems, vehicle management systems and others. Additionally, the market has been segmented on the basis of vehicle type which includes light protected vehicles, infantry fighting vehicles, armored personnel carriers, unmanned ground vehicles and armored amphibious vehicles. The market size and forecast from 2015 to 2023 have been provided in the report in addition to the market size of 2014. 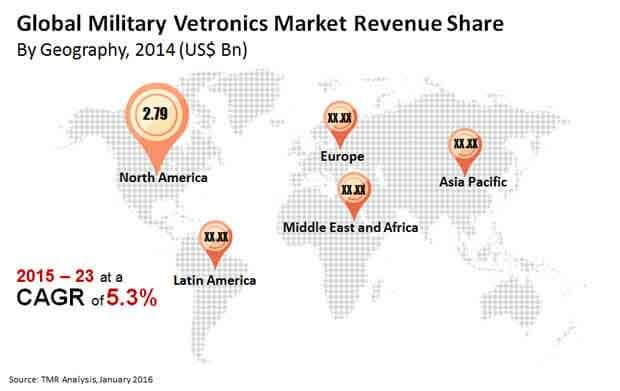 Analysis of macro and micro economic factors driving and restraining the growth of the global military vetronics market has been covered under the scope of the study. The market attractiveness analysis provided in the report, highlights the major areas for future investments in the global military vetronics industry. The report is intended to help vetronics systems suppliers and manufacturers in understanding the current and upcoming opportunities in the global military vetronics market and formulating their business strategies accordingly. In addition, governments, military organizations and other buyer communities are also expected to be benefited from the report. This study includes the profiles of 15 major players in the global military vetronics market and the strategies adopted by them to sustain in the competition. Recent developments by the key players in the market are expected to facilitate the emerging players adopt effective business strategies. The study is expected to help key players in the market and governments across the world to formulate and develop new strategies related to military vetronics development and integration. The key participants in the global military vetronics market include Curtiss-Wright Corporation, Oshkosh Corporation, Ultra Electronics Ltd., TE Connectivity, SAAB A.B., Kongsberg Gruppen ASA, General Electric Company, BAE Systems plc, Rheinmetall Defence, Moog, Inc., Lockheed Martin Corporation, Elbit Systems Ltd., Thales Group, The Raytheon Company and General Dynamics Corporation among others.